Q. What is the OPTI-SWITCH™ on the Heat Smart® Infrared Heating System? Q. What makes the Heat Smart® Heater "Healthier" than other heaters? Q. How much power does the Heat Smart® heater draw? Q. Why is the Heat Smart® quartz infrared heater purchase price more than a space heater? Q. What makes the Heat Smart® Heating System different? Q. How does the initial cost and savings compare to other heaters? Q. How much area does a Heat Smart® Heating System heat? Q. How does the comfort of the Heat Smart® heater compare to other systems? Q. What kind of warranty does it have? Q. How do I get my heater service? Q. Is the Heat Smart® Heating System safe? Q. Economically, how does the Heat Smart® heater compare to other systems? Q. Where is the Heat Smart® Portable Zone Heater most often used? A. The Heat Smart® infrared heater is a revolutionary portable furnace that safely and efficiently heats the objects in a room using infrared waves as opposed to less efficient systems that use radiant or solar radiation. With the use of modern technology we have introduced a special feature on the Heat Smart® infrared heater called the Opti-Switch™. It is revolutionary to other Quartz Infrared Heaters. With the flip of a switch you can reduce the amount of electrical current flowing into your unit by one-third thus reducing your heating costs even more.The Opti-Switch™ is exclusive to Model Heat Smart® "Victory"™ (SSG1500). Model Heat Smart® "Liberty"™ (LT1500) & "Star XL"™ (MT1500) have a High-Low setting option built into the LED display and remote control that functions the same as the Opti-Switch™. A. For one... Heat Smart® Heaters do not use up oxygen or dry out the air, nor does it produce positive ions like other blower type heaters. And the Heat Smart® heaters do not destroy healthy negative ions... it actually produces them. Since the early 1950s scientists have suspected that ions play an important role in how the body functions and in how we feel. Research has shown that an abundance of negative ions in the air we breathe is highly beneficial. Conversely, scientists have found that if the air is charged with too few negative ions and too many positives, we become anxious, fatigued and tense. Positive ion poisoning has, in fact, been linked to heart attacks, aggravated asthma, migraine headaches, insomnia, rheumatism, arthritis, hay fever, and most allergies.Two... the internal temperatures inside the furnace destroy harmful biological pathogens including bacteria, virus, mold and mildew without creating a combustion cycle like other fossil-fueled space heaters and radiant/solar coil type electrical heaters. These types of heaters use up oxygen and they remove humidity from the air. A. All Heat Smart® heaters use 1500 watts. And by using the Heat Smart® infrared heater model with the Opti-Switch™ feature, you can reduce the wattage as low as 1000 watts, thus reducing the amount of electricity needed to operation your heater by one-third. A great feature as we move closer to spring or in smaller rooms not requiring the full 1500 watts. (Model "Liberty"™ (LT1500) operates on 900 watts on low.) The Opti-Switch™ is exclusive to Model Heat Smart® "Victory"™ (SSG1500). Model Heat Smart® "Liberty"™ (LT1500) & "Star XL"™ (MT1500) have a High-Low setting option built into the LED display and remote control that functions the same as the Opti-Switch™. A. This state-of-the-art technology is a zoned heat source in every respect. It has a miniature heat chamber, infrared heating elements, a solid-state electronic control system, dual high and low limit switches to regulate temperature and air flow, a stylish furniture grade, all wood cabinet, a sensitive solid-state thermostat with high voltage relays for turning the infrared elements on and off and a Sleeve-Bearing Scroll Fan. It is a revolutionary "Green technology" product in every respect.All Heat Smart® heaters, like a central heating system, will heat an entire area evenly and efficiently because the heat spreads rapidly through the entire room. That?s what?s so neat about infrared heat. Furthermore, Heat Smart® heaters are safe. It will not start a fire or burn you if you get too close to it. A. There are three major types of heat.The first is RADIANT HEAT. Radiant heat can be generated utilizing combustion or the burning of a fossil fuel, i.e. natural gas, wood, oil, etc. It can also be generated using electrical current to heat a coil, as in a baseboard heater, or to heat different liquids such as oil in a portable radiator. Radiant heat is a very long waveform that can actually be seen radiating off the earths surface in a mirage or off the top of a wall radiator. It is a very long wave pattern. The second is SOLAR RADIATION. Solar radiation is a very short wave pattern that includes all house wavelengths in the light spectrum that are both harmful and beneficial. Solar radiation is responsible for the burn you get by sitting to close to a fire or disc heater or by sitting out in the sun too long. Ultraviolet radiation falls into this solar radiation spectrum. Solar radiation has a very short wave pattern that cannot be detected by the human eye. Ultraviolet Radiation, for example, is a type of solar radiation and the wave pattern varies from approximately 180 nanometers to 270 nanometers.A third form of radiation is INFRARED RADIATION. It is the safest and most effective type of radiation to use for warming up the objects in a room including the human body. All Heat Smart® Heating Systems use safe infrared radiation to efficiently convert electrical power into therapeutic infrared heat. Infrared heat is by far the most economical type of heat for zone or area heating. Infrared waves vary from 5 to 14 microns which is much longer than solar radiation but much shorter than radiant heat waves. Infrared radiation is the perfect waveform for the most efficient heating systems. Infrared heat is also the most therapeutic type of heat, which is why it is used universally for all medical applications requiring heat applications as well as the preferred heat type in most saunas. 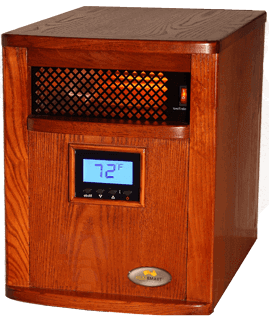 Infrared Saunas produce the same infrared wave that the Heat Smart® heaters produce. A. All Heat Smart® heaters combine new advanced engineering with the latest in infrared commercial quartz elements. The heat chamber incorporates a 'convection-style' heating process, proven to be more efficient than the earlier designs using heating tubes. The heat is transferred through water molecules in the air that act as a carrier for the infrared heat that is expelled into the room. Water molecules distribute the heat more evenly in the room than do the air molecules, which is why you eliminate most cold air pockets in a room by using moist infrared heat. It is a warmer gentler heat that penetrates the body more effectively than radiant heat. Water molecules weigh more than air molecules so the warm air will not quickly rise to the ceiling as happens with radiant heat systems.All Heat Smart® infrared heaters exhale what is coined as "soft" environmentally friendly heat that employs the humidity in the room as a vehicle to warm up large spaces quickly and efficiently. Conventional heat sources that dry the air cause occupants to lose energy and force them to breathe dry uncomfortable air. A. The Heat Smart® Heating Systems are an excellent source of heat for properly insulated rooms as large as 1000 sq. ft. Although other companies claim their infrared heaters will heat over 1000 square feet and more, we choose to keep our claims as close to reality as found in independent studies. Q. How does the comfort of Heat Smart® heater compare to other systems? A. The Heat Smart® infrared heaters are like a miniature furnace. They are state of the art systems that provide the most comfortable form of heat. Unlike traditional systems, which may leave a differential of up to 18 degrees from floor to ceiling, the Heat Smart® infrared heater/furnace produces infrared heat that does not concentrate near the ceiling. Heat is evenly distributed from floor to ceiling throughout the room. The even heating and higher humidity permit lower heat settings with more comfort, less condensation on windows and less static electricity. In independent studies, photos using infrared lighting demonstrated that the heat was almost perfectly even from floor-to-ceiling and wall-to-wall. The Heat Smart® Quartz Infrared efficiency is based on the distribution of energized air, not on just fan movement. This heat is coined as "soft heat" due to how comfortable it is. A. The Heat Smart® "Victory"™ (SSG1500) & "Star XL"™ (MT1500) heaters have an extended 3-year factory warranty ("Liberty"™ (LT1500) has a 1 year warranty), which includes the heating elements. All units have no moving parts except for the scroll cage fan. Our heaters have trouble free solid-state controls and a quick diagnostic analysis of any problem can be diagnosed over the telephone with our technical support team through customer service. Q. How do I get my heater serviced? A. Contact RPI and we will ask a series of troubleshooting questions to determine the nature of the issue. You will be asked to provide the product model number, serial number and date (Example: 0910-23). You will find this information located on the back of the heater and if necessary, your date-of-purchase information to determine if the unit is within the warranty period. Once RPI determines the nature of the problem, RPI will help you find a local dealer-operated service center or advise you to returning the heater to RPI service center. If the heater is within the warranty period, there is no cost to you for the parts. If the heater is sent to RPI service center for repair, RPI will provide a Return Authorization Number and the shipping address. You will be responsible to ship the product to RPI. RPI will repair or if necessary replace the unit and return the unit. If the unit is out-of-warranty, you will be charged $79.95 for labor to repair the unit, plus the cost of parts and shipping. A. The Heat Smart® Infrared Heating Systems have no flame or fumes. They are safe, with clean infrared heating elements, which provide the energy. Extensive testing has verified the safety of the Heat Smart® infrared heaters. All Heat Smart® heaters are ETL, UL and CSA Certified. A. All Heat Smart® heaters are the most economical way to heat. The Heat Smart® heater can use an average of 35% less energy than conventional electric furnace / baseboard systems because you will feel warmer with Heat Smart® infrared heat vs. radiant heat systems. This allows you to save energy by turning down your house heating system. Even more impressive results were found during comparisons with fuel based heating systems. Individual results, of course, depend on insulation values, local climate, and other conditions. And by optimizing with the Heat Smart® heater model with the special Opti-Switch™ feature, results can be comparably lower yet.The Opti-Switch™ is exclusive to Model Heat Smart® "Victory"™ (SSG1500). Model Heat Smart® "Liberty"™ (LT1500) & "Star XL"™ (MT1500) have a High-Low setting option built into the LED display and remote control that functions the same as the Opti-Switch™. A. The key is to Heat The Room You Are In ? Not the whole houseYour Heat Smart® heater can be used effectively in any properly insulated room. We suggest using one in the room you and your family spend time in and turn your house heating system down a few degrees. At night roll your Heat Smart® heater to the bedroom and save energy all night while staying warm in your room. Use your Heat Smart® in cold uncomfortable areas in your home, finished basements, back bedroom or in your office. Heat Smart® heaters are ideal for use in mobile homes, recreational vehicles, etc. Your Heat Smart® heater is to be used as an energy saving source of comfortable heat when employed as a supplement for other heat sources in the home. It's a more efficient, less expensive way to heat your home. Zoned heating is more cost saving and the "Green Environmental" heat is safer inside and outside your home. Your main heating system will thank you.